Eat In Switzerland does dairy well – the molten variety in particular. There’s something rather brilliant about eating hot bubbling cheese or chocolate while you sit nestled among the snowy Alps and this a scene the Swiss have nailed. From chocolate shops through to cafes serving raclette and fondue, there are plenty of opportunities to indulge a penchant for all things warm and milky in Switzerland, but if Emmental, Gruyere or Vacherin don’t do it for you, you’ll find plenty of other local cuisine to tempt your taste buds. 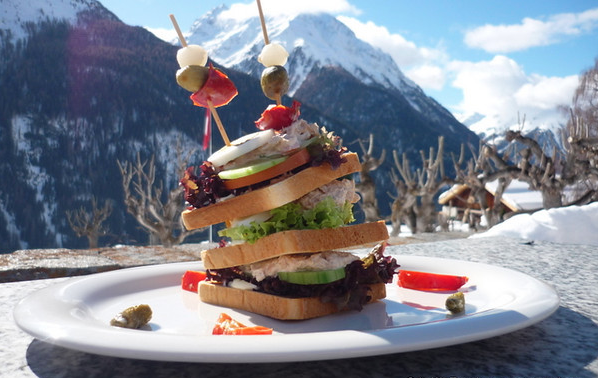 The Swiss have taken much influence from their neighbors in some of their favorite foods, so expect to find a touch of the French, Italian and German about some dishes. Traditionally a country of farmers, simple foods reign supreme in this region, but don’t be fooled – there are still a wealth of fine dining establishments. In fact, Schloss Schauenstein was ranked 30 in the list of the World’s Best restaurants last year and boasts the rather grand setting of a castle. Of course, top class dining anywhere in the world doesn’t come cheap. You can price up the cost of the Castle’s different course offerings using Travelex’s currency converter here – if it’s a little out of your price range, worry not. Forget hash browns – the proper crisp potato goods you should be heaping on your breakfast place are rosti and the Swiss are big fans. Eat with eggs and cheese on top for breakfast, or serve as a side to mop up creamy sauces with at dinner time. This is a very special sausage made predominantly of pork, which crackles up nicely when grilled. Originally the sausage also contained brain, though this ingredient is now thankfully prohibited..! Sausages in general are very popular in Switzerland thanks to German and Italian influences, so expect to see a Bratwurst or two. This herdsmen’s pasta dish is a Swiss staple. Alongside the key components of pasta and cheese, expect to come across bits of bacon and potato in your Alpine macaroni. This is definitely not a diet friendly option but it is certainly very tasty and comforting and there’s a slim chance the applesauce Alpermagronen is traditionally served with counts towards one of your five a day. This biscuit/cake dates back to the 1400’s, which pre-dates the Swiss’s love of chocolate and shows they’ve long had a sweet tooth. Made from honey, it’s flavored with finger and often topped with sugary glaze and candied fruit and nuts. It has become a gourmet breakfast choice all over the world but muesli is a Swiss creation. Invented by Dr Bircher at a diet clinic in 1887, it’s traditionally served with yoghurt or cream rather than milk and though predominantly eaten at breakfast time, it also makes a tasty supper snack. Another thing to keep in mind when visiting Switzerland is that every region has its own local specialties. In Graubunden for example, they are very proud of their traditional Bündner Nusstorte (nut cakes), a delicious but slightly dry pastry. Around Vevey you will find some great local wines in the vineyards that surround the small villages on the hills, and since milk chocolate was actually invented in Vevey there is a lot of chocolate fondues on offer as well. You will also find that depending on which region you visit, the cuisine will either be Italian, French or German influenced. What is your favorite food to try in Switzerland? While I agree with nearly all your observations, I would only caution any travelers to order veal chops in upscale Swiss restaurants that are priced by by weight. Thanks for the tip about the papet vadois – although perhaps not the best combination to the nut cake, haha! Leckerli is flavoured with finger ?? Nice insight into Swiss food, I’ve only ever heard of Rosti before. Definitely did not know they invented muesli ! !